Registrations for Clean Up Day 2019 are now open. During a week of action in 2018 an estimated 668,850 volunteers joined together to clean up their local parks, waterways, beaches, bushland and roadways – reinforcing the relevance of Clean Up Australia day as the largest community mobilisation event of its kind in the Asia Pacific region. With the recent passing of our founder, Ian Kiernan, and the fact that 2019 is the 30th anniversary of the first Clean Up, Clean Up Sydney Harbour, our aim is to make this event even bigger this year. You can participate in any of these initiatives on other days too. To get involved in 2019 visit Clean Up Australia. 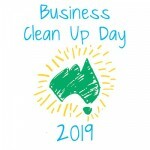 For information about Clean Ups for Business please email or call Wendy Chapman 02 8197 3408 or business@cleanup.com.au.